MedWOW is THE multilingual online marketplace for trading medical equipment and connecting buyers and sellers globally. Hundreds of thousands of complete systems, parts, accessories, and medical supplies are posted for sale and auction! The user-friendly, international website connects buyers, sellers and service providers of medical equipment from all over the world by offering: comprehensive professional services, unprecedented reliability, multilingual customer support and top value. What Does a Forced-Air Warming Device Do? A forced air warming system is a medical electrical device used to help keep patients warm during anesthesia and surgery. The forced air warming unit is made up of a reusable controller and disposable, single-use blankets. In operation the fan draws in air through the filter and the heating element heats it to a selected temperature, controlled by the thermostats. Heated air travels through the hose to the blanket, which connects to the hose nozzle. The blanket is double layered and inflates in operation. 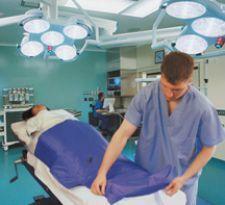 The patient contact surface is permeable to air and the warm air exits the blanket and moves over the patient's skin and transfers heat to the patient by convection. The most significant operational factors relate to the single use blankets. It is essential that the blankets are compatible with the controller and the range of blankets available for the controller is an important factor in the purchasing decision. The blankets are bulky and require storage space. Unplanned hypothermia (a core temperature of less than 36 degrees C) can negatively impact patients in many ways. Even mild hypothermia may contribute to complications such as: surgical site infection, altered drug metabolism, impaired blood clotting, cardiovascular ischemia, prolonged recovery following surgery and shivering. It is maintained by many professionals in the field that active patient warming is associated with normalizing patient temperature. The literature supports the use of forced air warming devices for normalizing patient temperature and reducing shivering. In addition, the literature suggests that forced-air warming is associated with reduced time in recovery. Also, it is agreed that both the perioperative maintenance of normothermia and the use of forced-air warming reduce shivering and improve patient comfort and satisfaction. It is recommended that normothermia should be a goal during emergence and recovery, and that when available, forced-air warming systems should be used for treating hypothermia. Inadvertent perioperative hypothermia is a common and preventable complication of surgery. Inadvertent perioperative hypothermia is defined when the core body temperature is drops below 360C and is associated with poor outcomes for patients. Prevention of hypothermia requires the use of simple measures, such as warm clothing, use of a duvet (comforter) or blankets preoperatively and active warming of the patient and intravenous fluids, especially in the operating room. A range of active patient warming devices have been designed for use in the perioperative and critical care environment, including: electric blankets, heated fluid filled mattresses, radiant warmers and forced air warming devices. The cost of disposable blankets is the most significant cost of forced air warming and purchasers should make use of bulk purchasing arrangements in order to benefit from volume discounts. MedWOW offers a comprehensive selection of new, used and refurbished Forced Air-Warming Systems from a multiplicity of manufacturers and distributors throughout the world. As the main global eCommerce platform for all kinds of medical equipment, MedWOW features a comprehensive searchable catalogue that allows you to filter for make, manufacturer, continent, condition, price range, seller’s business type, heating intensity, size and uses when looking for the forced Air-warming device best-suited to your particular medical facility. Augustine Medical, Cincinnati Sub-zero, Gaymar Industries, Gibek, Kan Med, Mallinckrodt Puritan, Stihler Electronic and The Surgical Company. If you don’t find the specific Forced Air Warmer you are looking for, you can post a free buying request which typically will bring you a number of competitive quotes from MedWOW’s global distributors.